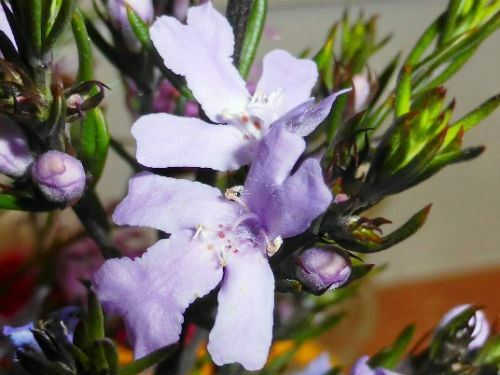 Westringia eremicola is a member of the Lamiaceae family in company with the Prostantheras and culinary mints. There are about 25 species and the genus is native to Australia. There are also many cultivars. Westringia eremicola is a small shrub with linear, slightly prickly leaves. The leaves are carried in whorls of three around the stem. Unlike the Prostantheras, Westringias do not have aromatic foliage. Westringia eremicola has white or mauve flowers that are carried in the leaf axils. Spring and summer are the main flowering periods but sporadic flowering may occur at other times. We have a form that produces masses of attractive mauve flowers. This form probably comes from the Torrington area, near Glen Innes, northern NSW. We have many specimens scattered throughout our garden. In our cold climate garden, Westringia eremicola has proved to be a hardy, free flowering small shrub. The species is frost hardy and drought resistant. A well drained situation in full sun or half shade suits Westringia eremicola. Rockeries and native cottage gardens would benefit from the addition of Westringia eremicola. Westringia eremicola is found in Queensland, New South Wales, Victoria and South Australia. The species propagates very readily from cuttings. The species was formally described in 1834 based on plant material collected by Allan Cunningham near the Lachlan River, central NSW. The species name means desert loving..